Large Bikes for Big Dudes - top tupe lengths. Discussion in 'Downhill & Freeride' started by slothy, Apr 14, 2008. Many people ask the question....whats the biggest bike? Below are my findings of some of the top dh bikes, I have my big hit in there as thats what I have. Top Tube Length. Sizes in inches. The longest DH frame I have ever seen was the first generation V10. The large was very big. I think there was even an extra large. VP Free frames run big too and there was an extra large made. My old VP Free was an medium and it felt only slightly smaller than my current large V10. The large VP Free that I test rode was enormous. Can't imagine how big the XL is. Cannondale Perp comes in XL. yeah that is a really great suggestion. you should go with the cannondale. isnt it a cute little thing? I believe Turner did a run of Highlines with a 25.0" TT - not sure if that was a rumor or not. I'm 6'5"-6"ish and have spent a lot of time thinking about this sort of stuff. The effective top tube could feel larger or smaller than published number depending on the seat tube angle. Slacker seat tube angle will feel shorter than one with a steeper seat tube angle. Most companies do not publish "rider area" numbers which is a shame. Rider area is the length between the bottom bracket and head tube. On a DH bike you only really "touch" the bike at the cranks and bars it is a better measure of how a bike will fit without actually sitting on one. Nagaredama that is a great comment. that is about the only thing that in trials bike they got right. while they don't publish the number its super easy to figure out on them. The OP did some serious due diligence. Good for you, sir. The Giant Glory is an excellent bike for a bigger rider. That would be my recommendation. It's also what I chose for myself, and have had for two years. yeah the cannondale perp size XL has a 25 inch top tube... nice one. the cannondale also has the longest chainstays known to man. I'm 6'5 and ride a Sinister Splinter (large). TTT of 24.5. Fits me perfectly, but it is gargantuan for everybody else. Wow is right! Back in the day all anybody could say were that Rotecs had stupid long CS's at 18 inch now it seems its back and in vogue with some mfg's go figure. Does anyone know where to get a large glory dh frame[preferably used]? Check out Turner. They make XXL in their more XC and trail models. I am not that familiar with the DH side but usually pay attention to such things as well due to my height. you guys do realize that even effective top tube isn't a very accurate way of measuring a bikes size right? I posted this concept in measuring the top tube(for lack of better words) years ago. Like mentioned earlier in this thread...BB to head tube. 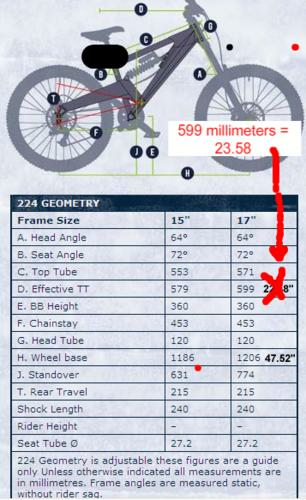 Not down tube really but the distance between two virticle lines drawn through the BB and the top of the head tube. Even did a quick MSPaint rendition for a visual. the large mongoose ecd has a 25 inch top tube, i have a 08 for sale if interested. i called the measurement the front center, which is wrong really. front center is the distance between the bb and the front axle. i followed the convention used by turner, and the only difference between your convention and turners is that tuner uses the bottom head set cup. yours is the top head set cup, small difference but still important. lol I thought it was lost it was so old. What is strange is they are almost exactly a year apart. Interesting. I chose the top of the head tube because that is where everything goes that you will eventually hold on to. 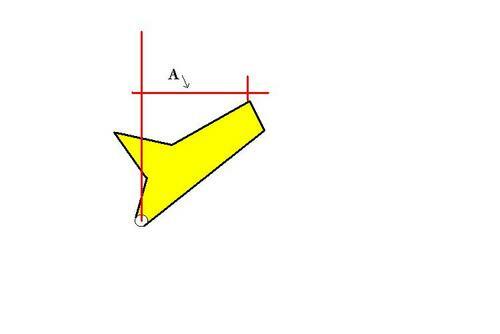 Head tube length and angle can change the location of the top of the head tube in realtion to a verticle line comming from the BB. More detail would be distance (vertically and horizontaly) from each other. Atleast that is how my mind works... could be way off. Wouldn't be the first won't be the last.